In shoujo anime, or anime made for women, “love” is the gravitational center around which the characters and plot points fold. Our leading lady’s flaws are gaps only her crush can fill. The plot is a slow sanding-down of her hard edges, preparing her for companionship. And, when the string track swells at the end of the final episode, she’s in her lover’s arms and the curtain falls. Kae Serinuma’s is a by-the-book fujoshi, or a hetero girl whose peak sexual fantasy is two guys kissing, either in “boys’ love” manga or ten feet away from her. 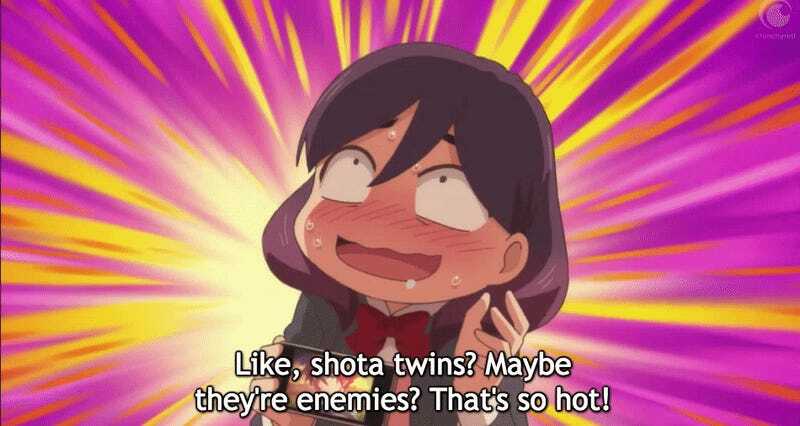 Her mouth froths when her favorite anime boys hug. Her face contorts into a screaming blob at local manga conventions’ merchant booths. Nothing matters to her more than who’s a top, who’s a bottom and where she can find fan art of it. When we meet her, she’s the chubby, pigtailed girl in the back of gym class. After two of her male classmates pass a volleyball and she yells “Score!” a little voyeuristicly. Nobody minds her at all until her beloved, fictional anime beau Shion is fatally injured at the end of a Mirage Saga season. Devastated, Serinuma forgets to eat for a week. And, when she arrives back to school, slim from her mourning period, four dashing men and a chivalrous woman fall in love with her. Much of the story follows the boys coming to terms with their shallow affections, learning to love her for her unparalleled passion—even if that passion is for boys’ love manga. In one episode, Serinuma gains back the weight she’d lost after a chocolate binge. Her harem—excluding the woman—mourns, scheming to make her skinny again. She agrees to try working out only to impress Mirage Saga representatives at an upcoming awards ceremony. As a reward, the boys agree to fujoshi-themed incentives like ear-licks and hugs. Back at her original weight, some of the boys come to admire qualities other than her beauty. It’s her kindness and passion that hook them, and they soon realize that their original interest was embarrassingly shallow. But the whole thing’s a trick. Viewers are led on to think that the harem’s feelings about her matter. They don’t. She’s never swayed by their more honest affections. She just keeps loving Shion and shipping him with his co-star, Terra. Using Serinuma as a foil, the show’s men actually see their hard edges sanded down. In competition, they constantly try to out-man each other throughout the show. The only thing that they feel works is participating in her fujoshi activities, like choreographed dances to Puri Puri Moon, which they come to love for on its own terms. Once, feeling emasculated by his competitors, the youngest boy runs away during a forest hike, only to get lost. Serinuma finds him stranded and wrapped in ivy, like a scene from some raunchy manga. She spits blood out of her nose in happy surprise. Later, embarrassed, he says, “I’m not strong like these guys are. And maybe I’m not on the same level as them yet. But, still…,” he says, thinking of how wonderful she is. And, for the most part, he gets over his inferiority complex. Turning a fujoshi into a love interest makes Kiss Him, Not Me a very strange shoujo anime. Junko, the original manga’s illustrator, cut her teeth on dirty boys’ love comics. She’s uniquely positioned to understand the “kiss him, not me” mentality. Throughout the anime’s 12 episodes, Serinuma isn’t swayed by any of her suitors. She doesn’t self-actualize as a hot girl, suddenly reveling in lip gloss. 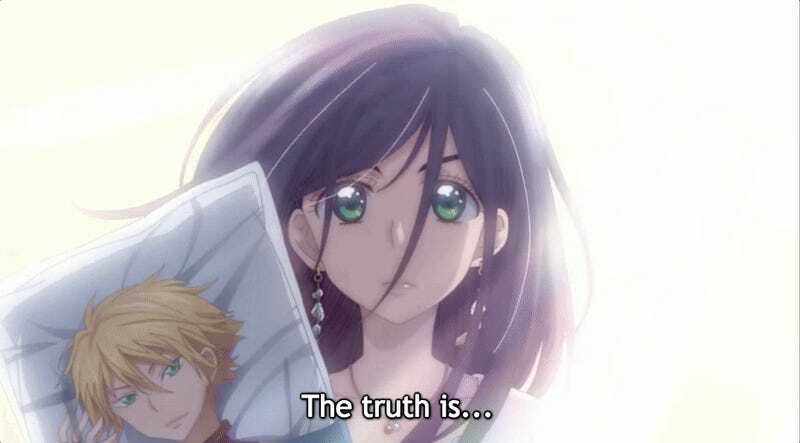 She never wavers in her fanaticism over the fictional Shion. And, when any of Kiss Him, Not Me’s boys even touch her, she’s scared and repulsed. Kiss Him, Not Me subverts shoujo’s tendency to judge women’s qualities against their appeal to men. Sometimes, girls don’t want to be kissed. And that doesn’t change because they’re suddenly attractive. 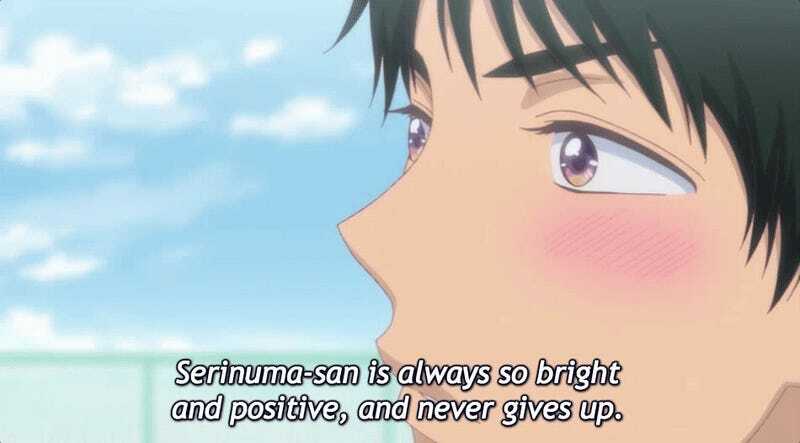 Serinuma’s insane obsession with boys’ love isn’t really a flaw in Kiss Him, Not Me because the show isn’t a beeline to love. Her quirks aren’t stopping her from “becoming” herself because she’s already there.